How does Katie McGarry do it? With each book, she gets better and better. She is, without a doubt, one of my favorite contemporary authors ever. I'm impressed with how she continually writes heart-pounding, realistic contemporary stories that never fail to wow me with their well-developed characters and swoony romances. I think Rachel might be my favorite main character from McGarry's books. It was refreshing that she wasn't as tough and jaded as Echo and Beth were. I guess the best way to describe Rachel would be that she's innocent and naïve - which is true - and yet that description implies that she's annoyingly clueless, which she absolutely isn't. Rachel may be considered innocent and naïve, but she's also smart and determined, and I thought she was a very strong heroine. Rachel is a lot like me, actually. She has a fear of public speaking and suffers from panic attacks, which she tries to hide from her family. I've never suffered a panic attack, thankfully, but I hate being in the spotlight and could completely relate to her and the emotions she felt. I love her character arc and how, throughout the book, she learned to stand on her own and open herself up to her family. I love the romance between Isaiah and Rachel. It may be considered insta-love, but as I've said before, insta-love can work if it's well-written, and this is Katie McGarry - duh, it's obviously very well-written! Isaiah and Rachel's relationship is pushed to the limit as the book progresses. They have to decide whether they truly trust each other, and they learn to work together to pay a debt that has put their lives in jeopardy. 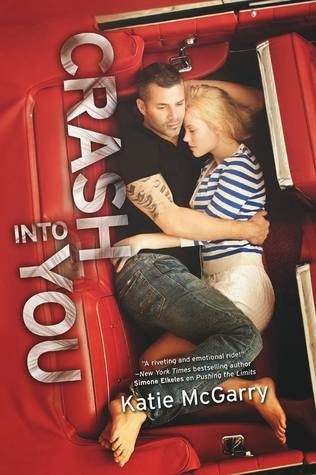 I absolutely loved Crash Into You. If you haven't read any of Katie McGarry's books yet, you're missing out on some of the best contemporary books I've ever read! As always with this author's books, Crash Into You has heart-pounding drama, a gorgeous love story, and amazingly developed characters. I can't wait for the next book, Take Me On, to come out!